Spooky dub, experimental casio, ghost synth, low key high altitude stoned electronic jazz. Think Tortoise with a bong in its face and a doctor Suess hat if you simply must. At times can be straight up Residents level absurd in its own mysteriousness. Other times as chill as a twilight joyride in your cadillac with the love of your life by your side (borderline vapor wave but thankfully nothing as "it" as vaporwave). This album fluctuates in tone and mood, so it's great for the club but also for the hooka bar afterwords and then for the satanic seance that you'll host after that (All hail Moloch!). 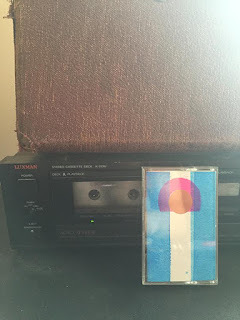 The cassette gets really spacey, like Grateful Dead "Space" spacey, but a little more loopy because this is recorded in late 2015. Great unexpected accompanied parts by analog percussive, moogs and noise. Notes ring, pulse, haunt in their reverberation, but there is then a surprising energy and pulse in the form of spontaneous bass lines and ween vocoder silliness. This is a loose cassette that goes many different directions and it works in the favor of the release. it's most definitely not a concise album with a theme, and can be jarring to listen to as a single piece, but each song individually is very strong and their arrangement makes for surprise. A Cassette Gods gem.